Use our truck free when moving into your storage unit. You get four hours and 30 miles free (*This may vary depending on location). Gas is included. No special license needed. Our free moving trucks are available at most locations. Call your nearest storage location for more information about availability, insurance, and required deposit. Or call 888-780-5400 to learn more. What can I fit into the moving truck? Our trucks typically hold the contents of a 10’ x 10’ storage unit. Can I rent a moving truck? 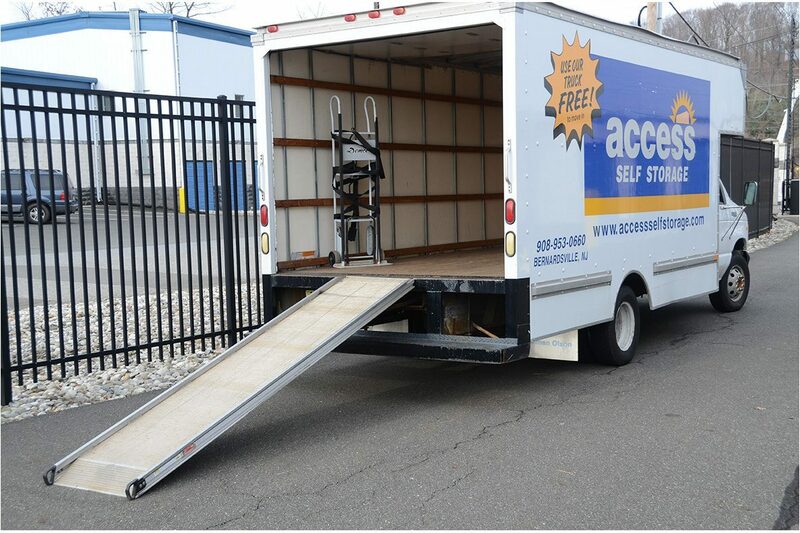 You can use our truck free when moving into your storage unit. After move in, you can rent it inexpensively for later trips to and from the storage center. Our Green Brook, NJ location rents trucks from a national company. Load one-quarter of the truck at a time and tie down each quarter as you go. Appliances and heaviest items should go in first. Mattresses and table tops fit nicely along the sides. Load the truck first with items that should go into your storage room last so you can access them more easily. Use plenty of blankets and cardboard to protect your furniture. Place mirrors or pictures between a mattress and box spring for a smoother ride. Bend your knees when lifting heavy objects. Pull the hand truck up the ramp (don’t push), so you are always higher on the ramp than the loaded hand truck.